The story of Universal Pictures and Illumination Entertainment's Minions begins at the dawn of time. Starting as single-celled yellow organisms, Minions evolve through the ages, perpetually serving the most despicable of masters. Continuously unsuccessful at keeping these masters-from T. rex to Napoleon-the Minions find themselves without someone to serve and fall into a deep depression. The trio embarks upon a thrilling journey that ultimately leads them to their next potential master, Scarlet Overkill (Academy Award® winner Sandra Bullock), the world's first-ever female super-villain. They travel from frigid Antarctica to 1960s New York City, ending in mod London, where they must face their biggest challenge to date: saving all of Minionkind...from annihilation. 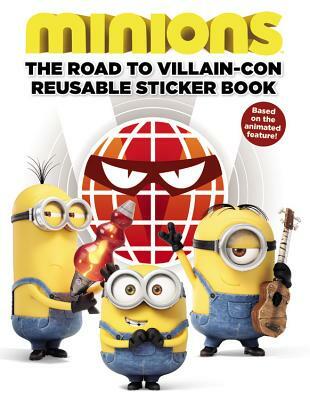 A reusable sticker book based on the new feature film! Trey King has been reading and writing kid's books since he was little. He currently lives in New York City, where he likes to ride his bike and play video games whenever he's not climbing a tree.